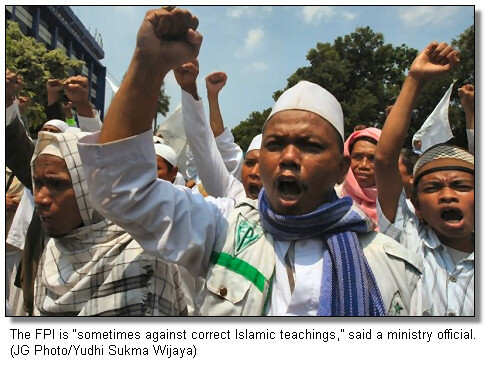 In the wake of another case of allegedly “misguided” Islamic teachings that contravene the nation’s blasphemy law, the Ministry of Religious Affairs on Tuesday said there were about 70 potentially illegal sects in Indonesia, including the hard-line Islamic Defenders Front. “We can also say that the Islamic Defenders Front [FPI] is one of the sects as sometimes they are against correct Islamic teachings,” said Rohadi Abdul Fatah, the ministry’s director of Islam and Shariah law. Speaking to the Jakarta Globe, Rohadi also identified the sects of Islam Katolojo, Darmo Bandul, Islam Kejawen, Muhammad Nabirasulillah and the Ahmadiyah as being problematic. Tangerang Police on Tuesday said they had questioned the leader of Perguruan Cakrabuana and two of its followers for allegedly violating the 1965 Law on the Prevention of Blasphemy and Abuse of Religion for its interpretation and teaching of the Koran. The blasphemy law is outmoded, according to some liberal Islamic scholars, and is currently being challenged in the Constitutional Court for curtailing religious freedom. The FPI infamously ambushed a peaceful rally organized by the National Alliance for the Freedom of Faith and Religion in support of the Ahmadiyah at the National Monument in Central Jakarta in late 2008. FPI chairman Habib Rizieq was later sentenced to 18 months in prison for his role in the attack, although the government later issued a joint ministerial decree ordering the Ahmadiyah, a peaceful Islamic group founded in the late 19th Century, to restrict its religious activities. FPI deputy secretary Soleh Mahdmud said anyone who labeled the FPI as antagonistic to Islam did not understand the organization. Soleh said FPI members loved Islam and Shariah law and spread their message in a kind and gentle way. “But of course it’s different in a struggle,” he added. He also said that those who wanted polygamy outlawed were against Islam, whereas the FPI’s support of plural marriage was consistent with the faith. Rohadi, speaking generally, conceded there was little the ministry could do to control sects because many of them were in existence long before independence and any attempts to disband them could lead to chaos. He urged all religious groups to not take the law into their own hands lest that lead to violence. “If society is annoyed by such sects, they should report them to the police,” Rohadi said. He said that the country only recognized Ahlisunnah Waljamaah as the right path to Islam. Slamet Effendy Yusuf, head of interreligious harmony at the MUI, said current economic pressures could encourage people to join sects. He said this created new problems as the sects upset other groups, though he warned that it was better to adopt a persuasive approach rather than resort to violence.